From Hood River Oregon’s Logsdon Farmhouse Ales comes their “Seizoen”. This saison pours a cloudy golden colour with a huge white head. The aroma is of Belgian yeast, pepper and some fruity citrus notes. The flavour consists of Belgian yeast with sour and tart characteristics with a nice fruity and pepper finish. The alcohol content of this brew is 7.5%. This is a very good example of a Saison and I look forward to picking up more bottles of this in the future! This entry was posted in Imperial, Saison and tagged beerthirst, belgian yeast, fruit, fruity, hood river, oregon, pepper, saison, seizoen, sour, tart, usa, yeast, yeasty. 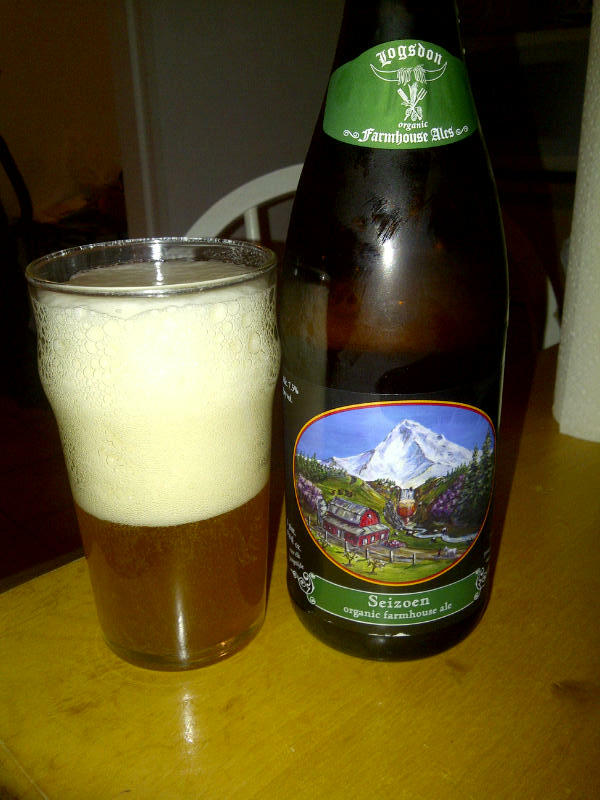 ← Oud Bruin – Yaletown Brewing Co.
Hopefully you’ve had their Seizoen Bretta, it’s much betta (couldn’t resist). It’s got what this beer is missing. This beer is great but the Seizeon Bretta is one of if not the best American beer I have had!